The sweet and creamy parsnip and apple mash is a great alternative to traditional mashed potato for this and many other dishes. Prepare the mash by placing the parsnips in a pan and covering with cold water. Bring to the boil and cook for about 8 minutes. Add the apples and continue cooking for another 3-4 minutes until both are tender. Strain well then mash with the butter and some seasoning. Cover and keep warm. Preheat the oven to 200°C, gas mark 6. Heat the oil in a pan and sauté the garlic and onion for 3-4 minutes. Add the carrots, stock, tomato purée, rosemary, redcurrant jelly and Quorn™. Stir well, season and simmer for about 5 minutes to heat through. Stir in the peas. Tip the filling into a 1.2 litre shallow pie dish, top with the mash and spread out evenly with a fork. Cook for 25-30 minutes until the mash is starting to turn golden and the filling is piping hot. Serve with some lightly cooked courgette and mangetout. 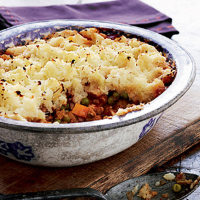 Add some grated vegetarian hard cheese to the mash just before you cook the pie. Vary the mash topping and try potatoes and carrot, or sweet potatoes instead.